On our last journey in to the Vaporworld, we finished translating all the text on Macintosh Plus’s Floral Shoppe, and reviewed some of the core concepts we’ve encountered so far, such as katakana, kanji, and the の particle. We even learned a new particle, と, which functions similarly to the English “and”. In this lesson, we’re going to get a bit more advanced, and dive right into the mystical dimensions of t e l e p a t h テレパシー能力者. Yet another legend in the Vaporworld, Telepath takes a different approach to the style than most musicians, seeking to explore the more dreamy and surreal sides of Vaporwave. 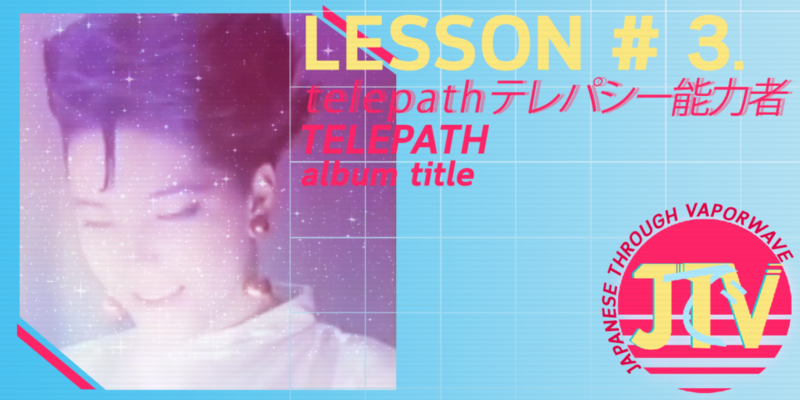 Telepath is certainly the most mystical artist in the Vaporworld, and as we will see in today’s lesson, the artist’s album titles and tracks tend to reflect this allusive, transcendent quality. Firstly, the most important thing is to look at Telepath’s actual artist name, which prominently, and notoriously, features Japanese characters. Thankfully, we’ve learned enough so far on our journey to easily be able to decode what’s going on. are both commonly used, but together the term “ability person” didn’t make much sense, and I suspected it was perhaps a translation error and the intended meaning was “talented person” or “skilled person”. But upon further research, I found an example sentence on Weblio which suggested that, taken as a whole, the name テレパシー能力者 literally translates to “telepath,” or “ a person with a telepathic ability.” This phrase doesn’t appear to be very common in Japanese however, as most of the results that appears when you look it up on Google are specifically related to the vaporwave artist. In any case, we can now slide deep into sleep mode in peace, satisfied knowing the full meaning of Telepath’s mystifying name. Next function: The album title. makes use of katakana, representing a foreign loan word, in this case what I suspect is a name. but in this case, I suspect Telepath may have been trying to create a Japanese translation of “Antara News,” which is the national news agency of Indonesia. This is the most prominent source I’ve found online making use of the name “Antara,” and that leads me to suspect that this is likely Telepath was referring to with the album title. which makes use of the katakana for the foreign loan word “news”. This is the typical way of representing news programs in Japan, as in Japan’s own national NHKニュース7. As to why Telepath would have made use of this particular title, it may have to do with the motif of the unknown and the anonymous in vaporwave. While Antara News is hardly anything mysterious to people living in Indonesia, for a traveller in a foreign country there is certainly something very strange and alienating about watching a television program in a language you can’t understand, employing social codes you’ve never before encountered. The experience can be daunting and alarming, but in that state of quiet shock there is also an element of beauty, like the beauty you find when embarking on the dangerous task of trying to scale a great, looming mountain. You may find that you ultimately lack the strength and the resources to arrive at the goal you have your sights on, but nevertheless, standing at the bottom, you might look up at the imposing, impossible object with a certain awe. The same is true with foreign media. It’s a matter of confronting the unknown, and there’s something somewhat spiritually beautiful about that. That is, perhaps, the meaning that Telepath was attempting to strike at with the title of this album. OK, that’s it for now, Vaporones. I’m very happy that these posts have been receiving as much attention as they have been, and I want to give my sincerest thanks to everyone who has been encouraging this project. I hope these lessons are of some use to you, and are helping clear away just a little bit of the haze found in that misty maze of the mysterious Vaporworld. Next up, we’ll look at the アンタラ通信 track titles. On our last journey into the Vaporworld, we examined the text on the cover of the Floral Shoppe album, and through it we were introduced to a few concepts in the Japanese language: Katakana, Kanji, and the の particle. 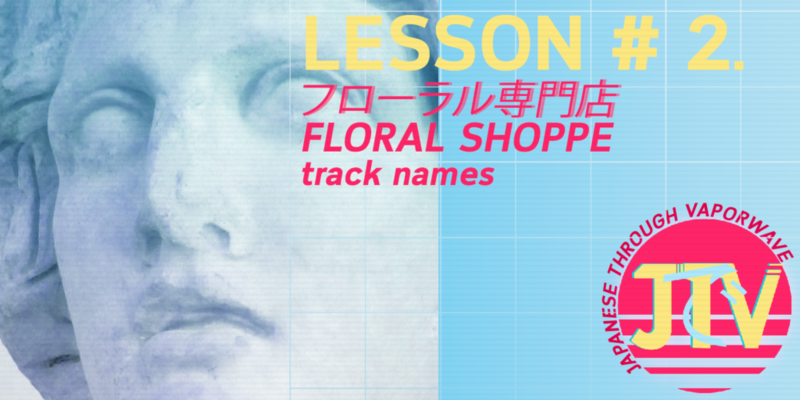 Today, we’re going to take things a step farther and update our knowledge by looking at the track names on the Floral Shoppe album. Let’s find out what all those mysterious characters mean, and learn a bit of Japanese while doing it! Note: The track titles that I will be examining are from the classic 2011 release of the album. There have been a few other subsequent releases, but I believe that this original release contains the tracks that most people are familiar with, and so we will be using this as the basis for this article. Remember what we said about katakana? It’s one of the two syllabic alphabets in Japanese, and this one is mostly used for representing foreign loan words, for some names, and sometimes for emphasis. In this case, ブート is using katakana to represent a foreign word, the English word “boot”. Now, hold onto your swivel chair, because this isn’t the kind of boot you wear on your feet. Instead, this means, of course, the action of “booting a computer”. While the word is indeed used in Japanese to refer to starting a computer, I haven’t seen it used a lot myself. Instead, 立ち上げる (たちあげる – tachiageru) seems to be used more often. This word uses two kanji: 立 (to stand up, rise) and 上 (up, above). Nevertheless, the term is idiomatic, combining 立つ and 上げる together, which are often seen as two separate words. Macintosh Plus’s use of ブートhere is actually correct, since, despite being from English, this word takes up much less space than 立ち上げる, and is more likely to be used on things like computer boot screens. It is a more than appropriate way of beginning our trip into this album’s strange world. Easily the most recognizable song on the entire album, it also features the longest track name and, by extension, a valuable opportunity to learn some Japanese! Let’s dig into it. By this point, we’re pretty much experts on katakana, aren’t we? Maybe we aren’t able to read the alphabet quite yet (I am currently working on an educational resource for JPT that will help readers learn how to read katakana – please keep your tabs open!) but at this point we at least know what it is. It is with katakana that this title begins, representing the name Lisa Frank, an American designer of colourful commercial images for children. The usage is entirely appropriate, since Lisa Frank isn’t a Japanese name, and would indeed be rendered using the katakana alphabet. The 420 part is a bit more mysterious – perhaps the implication here is that, after indulging in some 420 activities, the THC in your body will transform your vision of the world into something resembling a Lisa Frank illustration. I don’t know what recreational substances Macintosh Plus has been engaging with, but it must be some potent stuff. Finally, the character between 現代 and コンピュー is, as you probably all remember, the notorious の particle. As we said last lesson, it’s meant to connect two nouns together. In this case, the の particle is giving us more information about the main noun, which is, as we said last time, always the last one. In this case, the main noun is コンピュー, computer. What kind of computer is it? It’s a 現代 (gendai) computer – a modern computer! It’s a little amusing, seeing that the kinds of computers usually featured in nostalgia-rich vaporwave imagery are from around the 80s and 90s – I suppose those old models were 現代 at some point! This is a cute one, and shows something of the subtle humour demonstrated by Macintosh Plus in this album. This title, as readers of the last article probably know, contains the kanji 専門店, which means “specialty store”. The first kanji is just 花 (hana) – flower. So, this track title is just yet another way of representing the album’s title – Floral Shoppe. Again, note the use of the の particle, providing us more information on the last noun. What kind of a 専門店 is it? It’s, of course, a 専門店 of 花 – a Shop of Flowers! If you’ve been following everything so far, this title should be easy enough. Again, Macintosh Plus uses katakana to represent a foreign loan word. The word ライブラリ isn’t used too frequently in Japan. When it is used, it’s usally used in the sense of “a collection of works”, as in a software library – which, come to think of it, may have been what Macintosh Plus was intending when naming these tracks. As for the actual physical place where you go to look at books, in Japan they say 図書館 (としょかん – toshokan). Maybe when you go to the library, you’re compelled to visit the geography section? I’m not entirely sure what motivation Mactintosh Plus had for the naming of this track, but it is one of the two tracks on this album named after academic subjects – we’ll get to the second soon enough. Perhaps the names are simply meant to go along with the library theme, or evoke an image of retro educational resources? In any case, the artist’s intention was probably far more poetic than logical. There is something about the abstract ideal of attaining knowledge, of dedicating oneself to study and bettering the state of society, moving toward a looming ideal of ultimate happiness and satisfaction for everyone on the planet, that aligns with a certain utopian strain in vaporwave. I assume that ECCO in this track is a nod to Chuck Person’s Eccojams Vol. 1, another formative album in the vaporwave genre, which is itself a reference to the 1992 game Ecco the Dolphin developed for the Sega Genesis (also known as the Mega Drive, as seen in the giant text reading “MEGA” on the front of the album cover). 悪寒 (おかん–okan) is a word refering to “chills” and “shakes” – more specifically, the chills that go along with being sick. Literally, the two kanji 悪 and 寒 mean “bad” and “cold.” ダイビング is just a katakana representation of the English word “diving.” 悪寒 is noun, so it doesn’t make much sense to just press it up against ダイビング without an accompanying particle. I suspect Macintosh Plus’s intention was to say “chill diving”, with chill acting as an adjective. In that case, 冷たいダイビング (つめたいダイビング – tsumetai daibingu), or “cold diving”, may have been a better translation, but the text is nevertheless very charming just the way it is, imperfections and all. One more note: We’ve already learned about the の particle, but Macintosh Plus uses another particle here to link two nouns together. Can you tell which one it is? It’s the と (to) particle, of course! It’s pronounced like the little wiggling little things on your feet that help you keep upright. The と particle is a lot like the English conjunction “and”. So in this case, Macintosh Plus is mentioning two seperate subjects: ECCO and (と) 悪寒ダイビング. So free up some storage space, please, and make a mental folder for our second particle – と! We are sure to see it again in a future lesson. This is another easy one to understand. Like the track “地理”, this track title refers to an academic subject, in this case mathematics. Perhaps its another subject that you have an interest in, during your visit to the library? The two kanji used here are 数 (number) and 学 (study). 学 (gaku) is a common kanji that you’ll see a lot, especially if you’re in high school or university. It’s simply tagged onto the end of a word to indicate that it is “the study of” a thing. For example, 文学 (ぶんがく – bungaku) is the study of literature, and 哲学 (てつがく – tetsugaku) is the study of philosophy. Our current subject of study, however, is of Mactintosh Plus’s album Floral Shoppe, so let’s continue onto the last track title. This is the last track on the original 2011 release and also has a simple title, comprised of two kanji representing a single word – 待機 or, in English, “Standing By”. I assume the meaning Macintosh Plus was going for was in the sense of radio or television programs interrupting their broadcast in order to present the audience with a message – as in, “we are experiencing technical difficulties. Please Stand by.” That would suggest the ending of Floral Shoppe to be marked by a certain technical interruption, with the intention being that the regular programing will soon be resumed. But of course, in the case of this album, that program is never resumed, and the album comes to a full stop. It’s a bit of a creepy way to end an album, if that was indeed what Macintosh Plus was intending with this last track name. Nevertheless, the sentiment fits into the atmosphere of the Vaporworld perfectly – the warmth and comfort of recorded human culture is shut off, leaving you alone in the silence of a mysterious, dark, and threatening reality. That’s it! We’ve looked at the entire Floral Shoppe album! I hope this journey into the Vaporworld has been informative and interesting to you, and I hope you’ve picked up a little Japanese on the way, as well. Next time on Japanese Through Vaporwave, I will be taking a look at some of the music of one of the most notorious user of Japanese text in the Vaporworld – the mysterious, and always mystical, t e l e p a t h テレパシー能力者. See you next time! 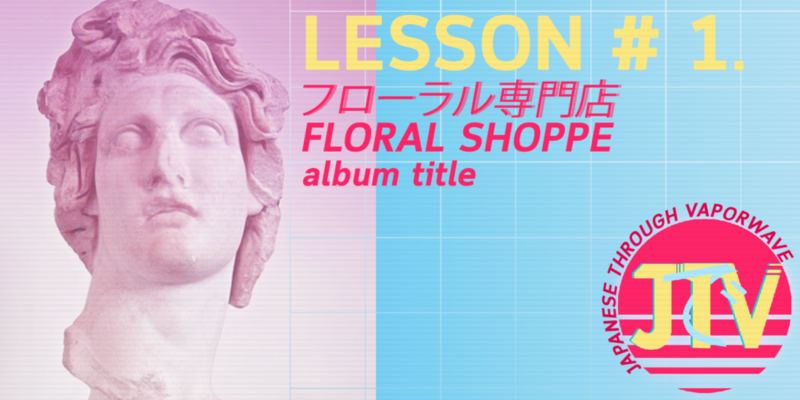 When embarking upon your journey toward the Japanese language through the Vaporworld, there is no better place to begin than Floral Shoppe. Considered by many to not only be the origin of vaporwave as a real genre, but also of the ubiquitous Japanese text motive, Floral Shoppe has truly achieved a legendary status. It would be difficult to find anyone in the Vaporworld not also familiar with this album. Because of that, the first portal we’re going to leap through is Macintosh Plus’s Floral Shoppe. In this first lesson, we will take a close look at the Japanese text on the cover of the album, and by doing so will come to learn about the Japanese ”の” particle and will be introduced to the concepts of Japanese katakana and kanji. Let’s initialize! プラス reads PU-RA-SU (plus) in katakana, which is one of the two Japanese syllabic scripts (the other is hiragana). Katakana is usually reserved for foreign loan words like アルバイト (arubaito – from arbeit in German – it means part-time work in Japanese) and バックミュージック (bakkumuujikku – back music, or background music), as well as for names, emphasis, onomatopoeia, among other things. It’s use is similar to italics in English, if italics were another alphabet entirely! フローラルの専門店 (フローラルのせんもんてん – furooraru no senmonten) is a literal translation of the album name, Floral Shoppe. フローラル (furooraru) is another katakana rendering of a foreign word, like we just encountered. This is of course a katakana version of “floral”, as in the title of the album. 専門店 (せんもんてん – senmonten) refers to a specialty store that stocks mostly items of a similar kind. In this case, our 専門店 is a フローラル specialty store – a floral store or, a Floral Shoppe! As a side note, sometimes “shop” is spelled as “shoppe” in English because it’s an older, more artistocratic-looking way of spelling the word, giving a store a more of an authentic feeling, I suppose. The same meaning isn’t really conveyed in 専門店, which is just literally a specialty store. We mentioned that Japanese has two syllabic scripts. Well, backup your harddrive, because things are about to get even more fragged up. Japanese also makes use of Chinese characters, called kanji (漢字), and there’s over 2,000 of them in common use in Japan. The more you learn Japanese, however, the more useful you’ll begin to find this aspect of the language. Being able to read lots of data in a single character can be very useful! It’s paticularily useful for making short track titles, as we’ll find later on. And since the Japanese language doesn’t use spaces (“ “), kanji is an essential way of making it so the Japanese language doesn’t just look like a long string of nonsensical text. Granted, if this is your first time studying Japanese, that’s how it probably looks anyway! But good things come to those who persist! Don’t give up! This article is your first step on the journey toward fluency! One more note – those students with more processing power may have noticed the の symbol connecting the two words in Floral Shoppe’s Japanese title. What’s the meaning of this!? Were you baffled!? What part of the title “Floral Shoppe” could this mysterious symbol possibly connect with? The answer is quite simple, thankfully. の (no, pronounced as in the statement “NO! Floral Shoppe Cassettes are all sold out!”) is a particle in Japanese – like the words “of”, “from”, “to”, “at” in English. Simply put, the の particle is used to connect nouns in Japanese. More specifically, in this case, it is acting as a modifying particle. That just means it’s giving us more data about the main word, which is 専門店 which, remember, translates as “specialty store”. So! What kind of specialty store are we dealing with? We’re dealing with a フローラル (floral) speciality store. The important thing to remember is that の usually is found connecting two nouns together, with the last noun being the most important one. Agedashi tofu from Sakata Ramen Bar and Grill. I later ate it. To help me in my Japanese studies, sometimes I'll search videos related to what I'm studying on Youtube. I thought I would share some of my adventures in translation for others who may be studying Japanese as well. This post was made to also be enjoyable to those not studying Japanese. Those who are just interested in the culture, and seeing how Japanese society might be similar or different to the western world will also hopefully find it interesting! So, recently I went to a place called Wako Sushi with a friend, and I ordered an agedashi tofu. I immediately fell in love. 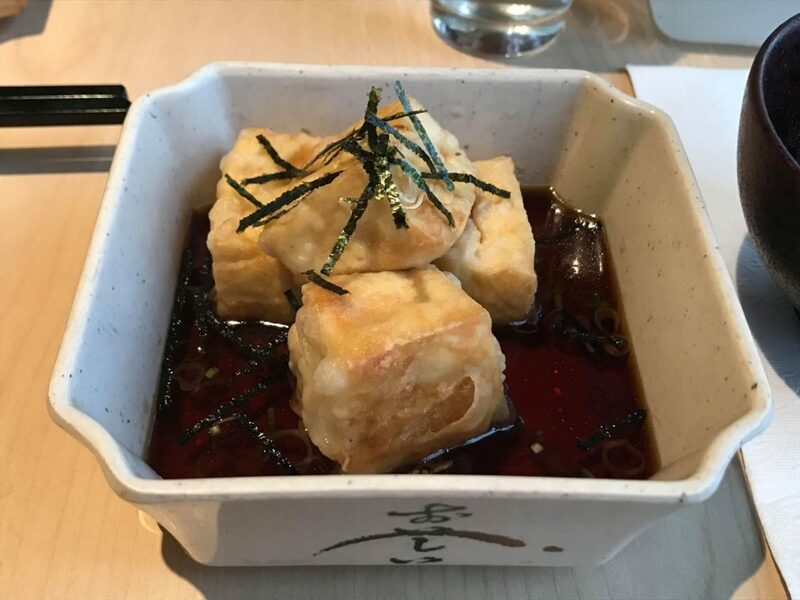 There's something inherently attractive about agedashi tofu, something in its crispy exterior and creamy interior that satisfies the soul's innate desire to be made whole. When it came time to study Japanese that night, I looked up the word 揚げ出し豆腐 (agedashi tofu), and attempted to find something interesting enough for studying. Typically, I like to find videos with lots of comments, since Youtube comments are a satisfying way sneaking into the world of colloquial language. Today we'll be looking at some Japanese Youtube comments as well. It's from a Japanese TV Program called 噂の！東京マガジン (Uwasa no! Tokyo Magazine) which has a segment called やってTRY (Give it a try!) 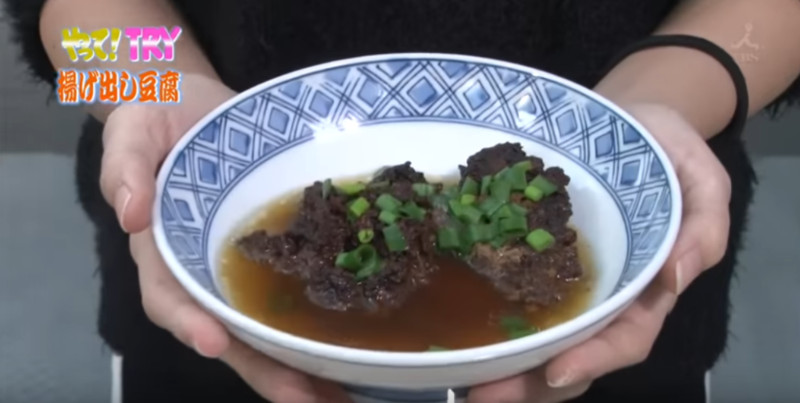 In this segment, a host approaches random people on the streets and asks them to make certain Japanese dishes. This episode deals, naturally, with agedashi tofu. 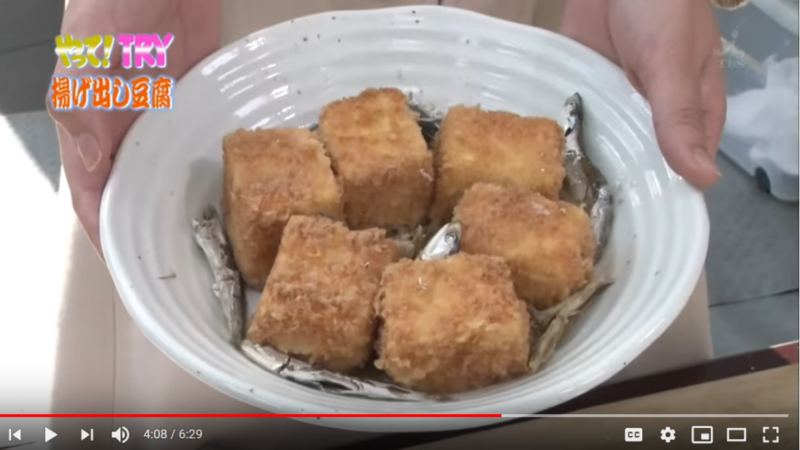 In the video, the host gets three different girls to try and make agedashi tofu. The results are all terrible (「めっちゃマズイ」 as one of the the girls says), but pretty funny nevertheless. I have to wonder if this video taps into a prevalent fear that the younger generation no longer knows how to cook, and a lot of the comedy comes from a confirmation of this incompetence. The first girl uses the word 想像する a lot. 想像 (souzou) means your imagination, or guess. So, in total lack of confidence, the girl is making a lot of guesses when making agedashi tofu. She doesn't really know what she is doing, but she's trying! Of course, making most dishes from memory is a difficult thing, and Japanese cuisine is even more difficult than most, so go easy on her, please! The second girl talks about how she is near the end of her teenage years, and wishes that she could stay a teenager (すっと十代でいたい). The host asks her why- is it any different (そんなに違う)? She says it is. The host asks in what way. The girl says 税金 (zeikin) – taxes. The host asks, what taxes (何税)? The girl says 印税 (inzei) - book royalties. Haha! The humor probably works a lot better in the Japanese, since the point is that the girl doesn't really know what she's talking about. When asked about taxes, she just says the first thing that pops into her head that sounds like a tax. 印税 (inzei) is not really a tax, but it ends with the “tax” kanji 税 and so, to her, may have sounded like a good answer. One commenter thought the finished agedashi tofu looked like a gravesite for sardines. I am not sure if I can disagree. Unfortunately, I'm sure her marriage eligibility is hurt by her innability to make proper agedashi tofu. 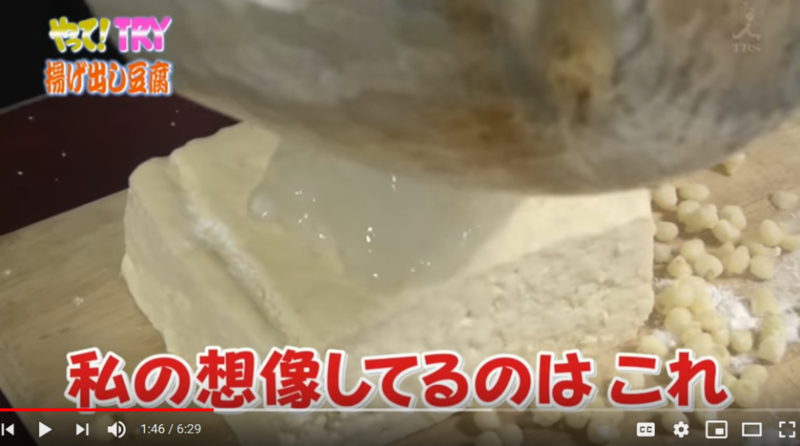 Though I will admit, out of the three girls in the video, the second one was probably the only one to make something that even resembled agedashi tofu. She could also benefit from learning a bit more about taxes, in my opinion. For example, this is what the third girl's agedashi tofu looked like. YIKES. LANGUAGE POINT – While のに usually means “although” or “despite”, connecting two phrases together, when it comes at the end of a sentence it can signify a state of what could have been, or a state of longing. In this case, the commenter is almost pained by the beauty of the girl. “Ah, she is so pretty, if only I could be with her” is maybe the implication. Creepy or not, I'll let you decide. That's it for my study of this video for now. It's pretty funny, and the video editors added a lot of stylized subtitles which by chance is very useful for people studying Japanese. I definitely recommend watching the video a few times and making notes about some of the dialogue, which is for the most part very conversational and casual. There are also a few other funny Youtube comments that are worth looking at on the video. I'll leave you with a haiku by Kobayashi Issa that I think is particularily relevant.